Superb Tasting of Fresh Juice with Tikki feel!! Your healthy journey starts here! Jump out of bustling street, there is a decent juice bar spotted. 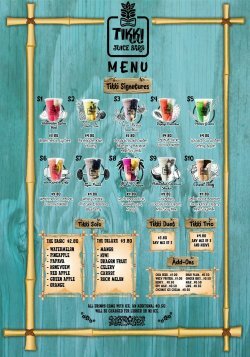 Established by a capableyoung boss, Tikki Juice Bars offered fresh fruits and vege beverages along with funky atmosphere ever. Simple concept with 10 signatures, basic juices and mix juices, hassle-free menu was given once I approached the counter. 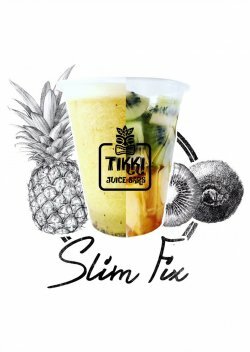 Well, talk about signature, I was impressed about Slim Fix. Mildly sweet, it seems to have more than enough fiber for our digest system. Components include Kiwi and Pineapple, which somehow blend very well together with honey, surprisingly! Plus, the juice recipe is excellent for detoxing with scientific proven. 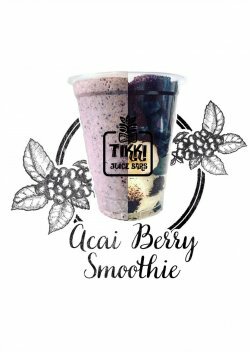 Will probably become the most famous shake, Acai Berry Smoothie is moderately silk with little sweetness. Research shows that Acai berries are extremely effective to lower cholesterol levels and good for our body cells. After adding banana which also called energetic-happy fruit, it definitely can cheer you up in a stressful day.Delivery services are provided for all Fuji Xerox Tenant. I found these juices much tastier than my usual place, enjoying natural fruity flavors with a reasonable pricing. So, what are you waiting for? Other Info. : Tikki Card for loyal customers coming soon! !